We found 0 verified Bramble Box promo codes for April, 2019. There’s no Bramble Box coupons or discounts right now, but sign up and get notified as soon as one becomes available. 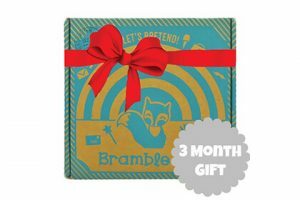 Bramble Box subscription boxes make a wonderful gift for kids who love pretend play and craft projects. They are designed for children aged 3-7. Every month, they feature a different theme, from Wizard Science and Doctor to Pizzeria and Thanksgiving. Discover more details about these award-winning subscription boxes in our Bramble Box review.